Hemerocallis or daylilies are known by gardners as the perfect perennial, it has dazzling flower colours, thrives pretty much in all soils and can tolerate drought. 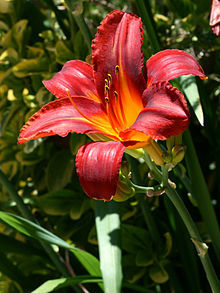 Hemerocallis are clump forming grass like pernnials with stap like green leaves and masses of flowers that last for a various amount of time from one day to a few weeks. Most varieties like to be planted in sun but darker flowers can go in semi shade.They require very little work and the flowers look very nice in arrangements. Some varieties are used in chinese cusine, they are sold fresh or dry and in asian markets are called gum jum or golden needles.